When people say a decision is difficult, this can mean two things: either it's difficult to decide, or it's relatively easy to decide, but the situation itself is difficult. I prefer to call the second type of decision "painful" rather than "difficult". This week I saw an example of this type of painful decision. Sarah is a foster mother in Los Angeles who broadcasts her experiences of fostering cats and kittens on Livestream. A friendly pregnant cat called Lily was rescued and given to Sarah's care. Sarah was happy to have a pregnant foster for the first time, and looked forward to broadcasting the birth of the kittens. When Lily went to the vet for her first check-up, the first test they did showed that she was FeLV (feline leukemia) positive, though she has not shown any symptoms. As is the usual practice, they did another, different, test, to confirm or overturn this diagnosis. The second test came back negative, much to Sarah's relief, and that of her viewers. However, after a few days it transpired that this negative result belonged to another cat and was given by mistake, and Lily's result was actually positive. This was a terrible shock, and forced Sarah to make a painful decision about whether to continue Lily's pregnancy. When a decision is difficult, there are two (or more) options with advantages and disadvantages that need to be weighed against each other. In this case, the advantages were mostly or entirely on the side of ending the pregnancy, while continuing it had overwhelming disadvantages. In this respect, the decision was obvious. 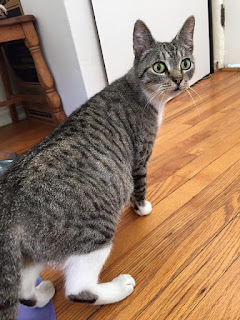 However, because it was a painful decision, Sarah deliberated and agonized for days, consulting with other fosters, the Director of Kitten Rescue (her rescue organization), and her vet. Everyone agreed that letting Lily continue the pregnancy and give birth would put her at risk. FeLV often breaks out and becomes dangerous when a cat is under stress, and giving birth would be precisely the sort of stressful event that could trigger the disease. So this was a clear case of the mother's life being at risk, which is a widely accepted justification for abortion. Secondly, the ultrasound performed during Lily's first vet visit showed that the kittens were underdeveloped. Two of them were much smaller and seemed to have no heartbeat, while another larger one did have a heartbeat. When there are abnormalities in the kittens, the delivery is often complicated. It might have been necessary to perform a Caesarean, which is risky in cats. And the kittens might not have survived anyway. Even if any kittens had been born alive, it would have been necessary to remove them from Lily immediately and not to allow her to wash or nurse them at all. This is because they could catch FeLV from her saliva and milk. This would mean that the kittens would be denied the benefits of the first few days of nursing on colostrum, which in healthy mothers contains special antibodies and nutrients that are very important to newborns. The mother-kitten connection would never be formed, and the kittens would have to be bottle fed from birth like orphans. This would not be ideal even for healthy kittens, and would not be ideal for Lily, who would be denied the comforts of nursing her babies. Of course, it was very likely that the kittens would either be stillborn or would be born infected with FeLV and be unlikely to survive very long. This being the case, the dream of healthy kittens seemed unrealistic, and aborting them started to seem more merciful than trying to save them against all odds, for what might be at best a short life of suffering. So Sarah had to take the very painful decision to take Lily to the vet for an abortion and spay. This would give Lily the best chance for a good life, until the disease takes over, and would avoid the risk that delivery would pose to her life, and the suffering of her kittens, even if any survived. When the vet performed the procedure, two seriously underdeveloped fetuses and two less underdeveloped ones were removed. It did seem that these babies would have caused birth complications and been unlikely to survive. While this is very sad, it does support the decision that Sarah had to take. Lily is now recovering, and will later go and live with a foster care provider specializing in FeLV positive cats. We hope she will have as many healthy and happy years as possible. We also hope that Sarah will soon be able to foster another pregnant cat who will have an easy delivery and delightful kittens! The kitten cams I watch show reality as it is. Sometimes it is hard to watch and learn about the terrible diseases cats can have. It is also hard to see the fosters, like Sarah, have to make such painful decisions when they are already emotionally attached to their foster cats. Their sensitivity is what makes them good fosters, but it also forces them to become stronger when things don't go as they would have wished. The only way to reduce the prevalence of diseases like FeLV is if more cats are spayed and neutered to prevent unwanted kittens, and more cats are adopted into caring homes where they are given proper veterinary care, including vaccinations. Watch Lily on Sarah's Kitten Cuddle Room. Excellent article - The reality is never easy to deal with, but as animal lovers we do what is best for those who have no voice. Absolutely well said! Kudos to you. Hugs for Sarah, and "Scritches" for Lily. Well done! A difficult story that needed to be told. It is definitely not all sweetness and light for these foster parents. They are pretty special people, really laying themselves out on the line. Thank you for this excellent article. And thank you, Sarah, for being strong enough to make the painful decisions. Saving Lily, was absolutely worth it. Thank you for this. I hadn't had a chance to find out what happened. Thank you Sarah, for being strong enough to make the painful decision. It was the right one for sweet Lily. May she live long and contentedly. Thank for your wonderful story. That which does not kill us makes us stronger, Sarah! Thank you for giving Sarah the credit she deserves! One facet that makes these decisions even more painful for foster cat parents who allow the world to join them on camera is that no matter how absolutely correct the decisions are there will always be viewers who, in the chat that accompanies the broadcast, find it necessary to be critical and go on about how the decision should be different. This only makes it SO much more difficult or as you say, painful. These foster parents need tough skins to go with their fragile hearts.